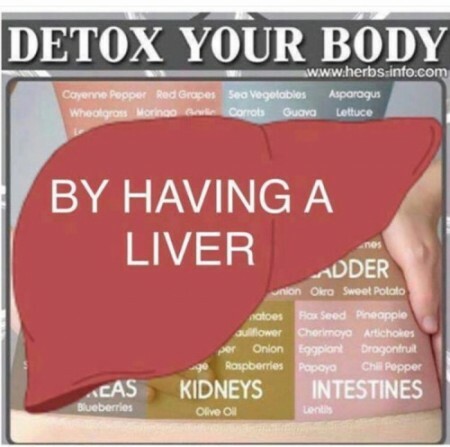 Detox your body by having a liver. The liver is a gland and plays a major role in metabolism with numerous functions in the human body, including regulation of glycogen storage, decomposition of red blood cells, plasma protein synthesis, hormone production, and detoxification. Consumer Reports – Do you really need to detox? But science does not support the idea that [the liver and kidneys] are lint traps for toxins and require cleaning. Instead, the liver converts toxins into compounds that are eliminated through the bile and urine, and the kidneys separate the substances that the body needs from harmful or unnecessary ones, which they eliminate. Here’s our take on three common forms of detoxification. The next time you are tempted to try a new detox diet, remember, you have a liver for that. Keep eating healthy, clean food and you’ll be detoxed just fine.